Adachi K, Xu J, Yeganeh N, et al; NICHD HPTN 040 Study Team. Combined evaluation of sexually transmitted infections in HIV-infected pregnant women and infant HIV transmission. PLoS One. 2018;13(1):e0189851. doi: 10.1371/journal.pone.0189851. The substudy included 899 mother–infant pairs. 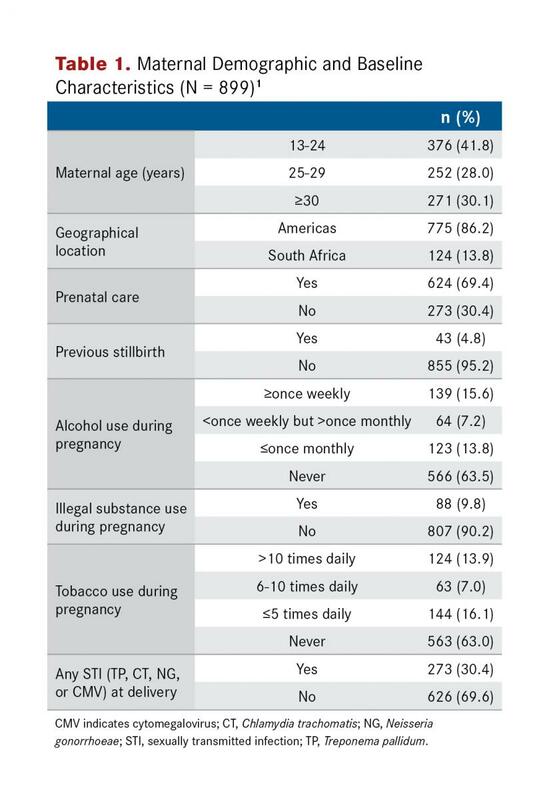 Most of the mothers included in the substudy (86.2%) were from the Americas (Brazil, Argentina, and the United States), with a mean age of 26.5 years (SD, 6.3) (Table 1).1 Although most of the women (69.4%) had received some prenatal care, they reported high rates of high-risk behaviors during pregnancy and poor outcomes during previous pregnancies (Table 1). 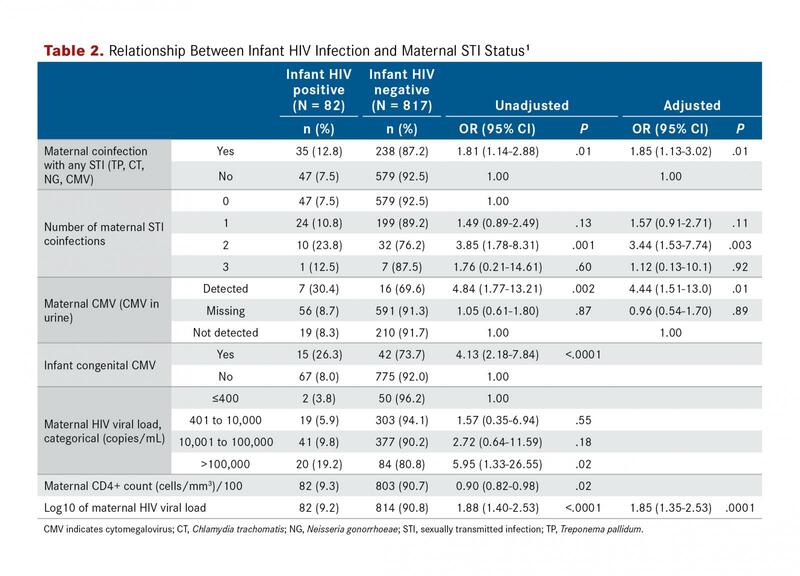 The results of this study demonstrated that HIV-infected pregnant women are frequently coinfected with other STIs, and that these coinfections are associated with increased risk of MTCT of HIV. The risk of HIV transmission was greatest among mothers with concurrent CMV infection, although the study authors noted that the association between HIV and CMV infection is complicated and not completely understood. The researchers speculated that maternal STI coinfections with CT, NG, TP, and CMV may trigger several different mechanisms that could result in MTCT of HIV. For example, such coinfections may result in cervical or placental inflammation, which may facilitate MTCT of HIV. This inflammation may also lead to immune activation and subsequent upregulation of certain T-cell receptors and inflammatory cell co-receptors, increasing the odds of HIV infection. Overall, the results of this study highlighted the importance of including STI screening as part of routine prenatal care, especially for high-risk pregnant women, such as those who are young and infected with HIV. 1. Adachi K, Xu J, Yeganeh N, et al; NICHD HPTN 040 Study Team. Combined evaluation of sexually transmitted infections in HIV-infected pregnant women and infant HIV transmission. PLoS One. 2018; 13(1):e0189851. doi: 10.1371/journal.pone.0189851. 2. Nielsen-Saines K, Watts DH, Veloso VG, et al; NICHD HPTN 040/PACTG 1043 Protocol Team. Three postpartum antiretroviral regimens to prevent intrapartum HIV infection. N Engl J Med. 2012;366(25):2368-2379. doi: 10.1056/NEJMoa1108275.